BIRTHING OF SHAMBALLA & . :333 NEW EARTH TIMELINES:. Eclipse season is upon us once again. We are finishing up pathways that we began in September 2015 and initiating higher inroads into our Divinity. A Solar Eclipse signifies an ending and a new beginning. We close the door on something and receive a generous catapult forward from the celestial bodies to open up a new chapter. This particular eclipse is a Total solar eclipse which has even greater potential. The Sun signifies our consciousness, our essence. It represents Who We Are, as well holding the codes for our ascended beings. There are 3 factors which contribute to the flavor of Tuesday's eclipse: it occurs in the sign of Pisces, there is a conjuction to Chiron the wounded healer, and there is an emphasis, with many planetary alignments, to the south node, which simply put, is our past self. Synthesizing these influences, we have an opportunity to heal a deep soul wound from the past and shift forward into a greater spiritual consciousness. As we heal ourselves, we heal the planet. As we heal the planet, we heal the cosmos. We are moving ever closer towards our reunion with our galactic family, and this healing work permits us to let go of the oppressive programming, ascend in frequency, and birth a new reality. This new reality is the reflection of our true nature, our Divinity, and is our birthright. In the New Earth we will recreate Shamballa, the dwelling place of gods and goddesses of Love. And so for our event activities for the Solar Eclipse, we will not only continue our work to heal Gaia's grids, and share our dreams with Her by imprinting them into Her Planetary Mind, but take the time to delve deeply into her recesses and receive the healing that we all so very much deserve. Our future beckons, and it's now time to Set it in Motion. Universal Law is the only Law, with Love as it's presiding principle and energy. The Planetary Body, Gaia~Sophia, is Free to evolve along Her chosen multi-dimensional timeline, in accordance with Universal Law. Interplanetary and interdimensional travel and exchange is freely & safely available to all, as the Earth and her inhabitants ascend into Galactic Citizenry. Contact, communication and communion with exiled Space and Soul family, Ascended Masters, Angelic Beings, and Benevolent Higher Dimensional Beings is freely and widely available to all, as they choose. The Land has been restored to it's Divine Blueprint of Beauty, Abundance & Balance, with pristine bodies of water, healthy, fertile soil and pure air. Fire remains in it's uncorrupted natural state. All forces of Nature operate according to Natural Law & Equilibrium and the principle of Ahimsa, “Do No Harm”. All living inhabitants and inanimate consciousnesses are Free, Sovereign, Self-governing entities and actively co-creating their Highest Destiny, in accordance with their Divine Blueprint, Divine Purpose and Highest Potential. Harmony between all species is restored and respect and cooperation exists between all kingdoms and races: human, animal, plant and mineral as well as the Angelic and Devic kingdoms. Peace reigns across the Land with open borders which allow the ability to travel safely and freely, at will and/or according to pleasure. All inhabitants are free to participate in cooperative interchanges between cultures, tribes, races, groups and individuals. Each being is centered in their Heart, connected to the One, the Goddess, their I AM Presence and all living beings. All personal will has been transmuted to Divine Will. All minds are Inspired and Illumined by their Higher Mind, the I AM Presence and Divine Will. All imperfections and illusions have been transmuted to Divine Will Expressions. All physical, emotional, and mental and spiritual suffering has been healed and transformed into Compassionate Wisdom. Christ Consciousness is manifest within the Hearts and Minds of all planetary beings. Divine Feminine and Sacred Masculine principles have been restored, unified, united and harmonized in balance. The principles of Purity, Beauty, Harmony, Balance, Gratitude, Humility and Compassion are manifest in all beings and forms. All Wisdom of the Universe, including Planetary and Galactic History is freely available to all who wish to access it, through the Akashic Records or other instruments. All DNA strands have been activated to their fullest potential with Grace, Harmony and Wisdom and Ease. All Beings have full recollection and memory of past, future and multidimensional lifetimes, as they choose. All Beings are free to celebrate their Divinity through their chosen medium. All Beings are Divinely guided and mentored, as they choose. There is an open and allowing acceptance of all belief systems. All Beings are Free to pursue their Heart's Desire, with every abundance available in the Universe. All creations of form have been impulsed and intended from the Higher Dimensional Planes and manifest in Love for the Highest Good of All. All Art, Music and Science reflect the sacred geometric principles of creation, in harmony with Natural Law. All technology exists for the purpose of, and in alignment with the elevation of consciousness of all Beings. An abundant supply of pure nourishing food & water exists and is available to all inhabitants. Sexuality has been restored to it's sacred form and function, as well as it's healthy expression between consensual loving beings. An egalitarian societal & cultural structure exists which includes all races, genders & ages. As you are wrapped in the Rainbow Light of the Earth, picture a Golden Ray of luminous light emanating from the Heart of the Galactic Center. See it traveling throughout all of the Sun Systems, the Great Central Sun, Sirius, and then to Alcyone, the Central Sun of the Pleiades star system. Feel it's great light and radiance, as it then travels into our Solar System. It is greeted by Helios and Vesta, the Mother/Father Lights of our Sun. From there, it will travel in a great shaft of cosmic light, towards the Earth, Beloved Gaia, who is illuminated with her rainbow magnetosphere. See this Golden Ray of Light enveloping the Earth with it's cosmic frequencies, coming all the way from the Galactic Center, to fill the earth, and all of it's inhabitants, with the encoded frequencies which shall lift our DNA up, back to our divine blueprint, to our Christed consciousness. See the merging of your aura and the earth's magnetosphere in this luminous light, charging you with the perfect level of frequencies which you need to activate your DNA back to it's original 12 stranded level of perfection. Feel the warmth, the bliss, the compassion and unconditional love which is now forever yours. Now see yourself connecting with your Earth Star Chakra, below your feet, and being drawn downwards in your merkaba, in a shaft of pure light, to Amenti. Amenti is the Heart of Gaia, and the Womb of Creation. You can picture Amenti however it feels right to you: a brilliant inner sun, a diamond crystal core, a fiery molten lake. As you arrive here, feel the warm embrace of Gaia, the Earth Mother, and Her Infinite and Unconditional Love. She tells you softly that it is now time to Let Go. That it's time to surrender the past and all wounds, all suffering, all loss, and everything that is not of the Highest Light. She tells you to surrender everything that you wish to let go of, to Her. Everything that is less than your illuminated self, it is now time to Let It Go. See yourself releasing everything created from illusions and old conditioned programming. See it all being washed away and dissolved in the brilliant heart of Her Love, gone forever. Feel yourself now, completely healed and renewed. Everything that remains within your being is in resonance with your highest path and your highest potential. The Light has now been turned on for new beginnings and the New Earth. See yourself setting your intentions for the next 6 months. Add any personal intentions as to what you would like to manifest in your life: any aspect of a greater abundance of Love, Life & Spirit which serves the highest good of all. See yourself as your I AM Presence, radiantly embodying your Ascension Light Body. 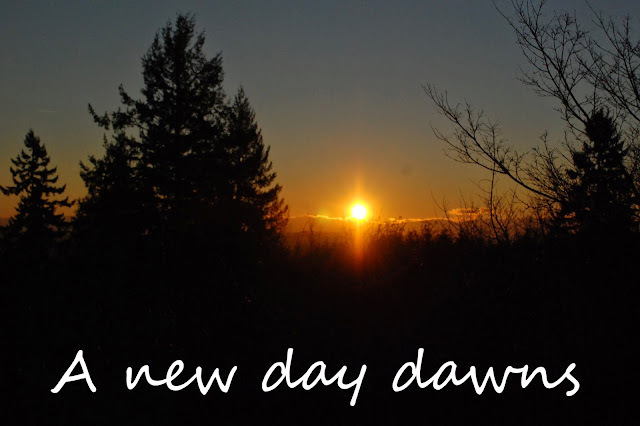 Give thanks to all the benevolent cosmic beings and energies, which act as stewards and guardians of these rays, as you come back, fully charged and ready to begin a new day as a fully christed, Divine Being. And So It Is. I AM THAT I AM. From one perspective, it seems like a cosmic thread is being woven. During the January 17th event, we were witness to comet Catalina passing the stars Mizar and Alcor in handle of the Big Dipper. 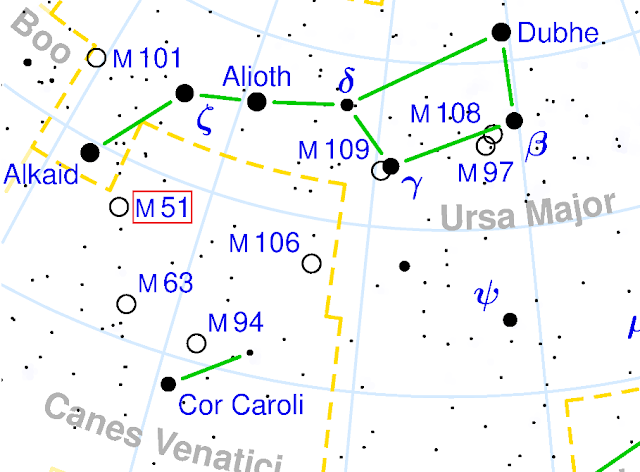 This 7-starred constellation, Ursa Major, the Big Bear, is the custodian of the Seven Rays of Divine Will. We also followed the path of the SUN creating blue apple orbs in the cathedral Rennes le Chateau. We paid tribute to the Cathars and reinstated the Church of AMOR, which has been linked with the Bride of Christ, Mary Magdalene. And now, for the event on February 14th, a day which traditionally reinforces the power of Love, we are lead further on in the story: the Seven Stars of the Big Dipper are also known in Hindu lore as the Seven Rishis (sages). “Fascinatingly, the Pleiades have also been likened to a bunch of grapes or Blue Apples. Ancient coins depict doves with bodies formed by bunches of grapes. The dove appeared in migration at the time of vintage, its purple-red breast like wine reminding the wine makers of their grapes. And speaking of Doves, the New Lunar month is under the influence of the sabian symbol: A large white Dove bearing a message. As above, so below. 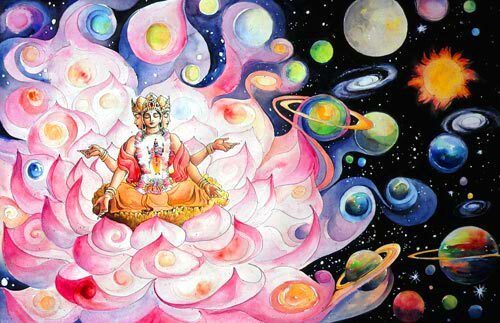 Through the merging of the Big Dipper and the Pleiades, the Rishis and the Kumaras, the Eagles and the Serpent Dragons, the Divine Feminine and Masculine, we bring forth once again the christed consciousness within ourselves which then cascades in affecting the planetary body. Through the work we are doing to open the higher dimensional timelines (5d-6d onwards) we are affecting the entire universe. 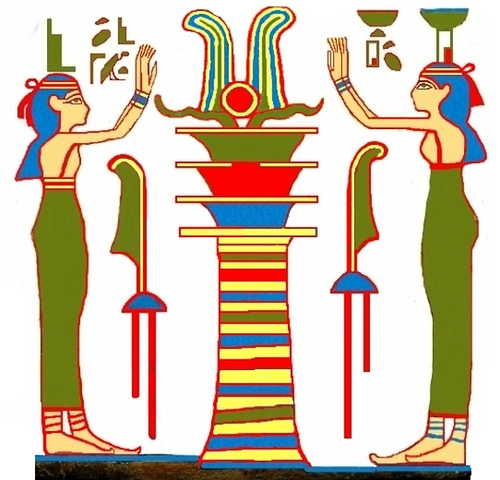 Ancient cultures of Lemuria, Atlantis, and Egypt used mantras and sound alchemy to raise the kundalini serpent fire upwards throughout the Djed column. Through the feminine power of Shakti rising through the chakras, and meeting Shiva in the crown chakra, they exercised the alchemical secret of reaching unity consciousness. And so we will also be tapping in to some sound alchemy, on World Sound Healing Day. I recommend going to the website and downloading the audio to use along with our meditation. To further ignite our christ consciousness, breathe deeply into your innermost self. 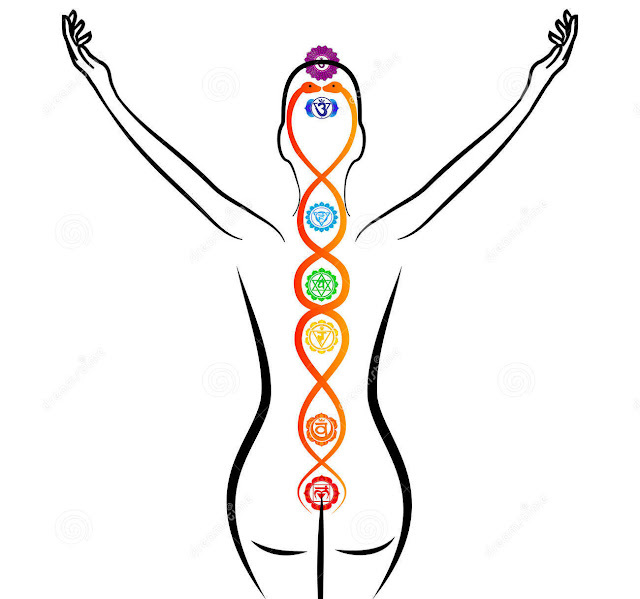 See all 7 physical chakras being your own rainbow-bridge to Infinity. Starting at the base of your spine, picture your breath uncoiling the Kundalini Serpent-Dragon power at your muladhara chakra. See the breath rise, in a double helix, touching each chakra, activating them as rainbow light vortexes of energy. As the breath rises, the left channel, called the ida is represents the feminine, the Kumaras (Pleiades), and the right channel, the pingala, represents the masculine, the Rishis (Big Dipper). They form a double helix and meet at their final destination, the crown chakra. Here they are merged in Divine Union, as Shakti and Shiva, activating your unity consciousness. You may sit in this consciousness for as long as you are guided. When you feel complete, picture this energy descending throughout your chakra system to the base chakra, and then travelling deeply into the earth, merging this energy with the Earth's heart, Amenti. Everything is falling into place now. The words of Alex Collier are the confirmation. It is the answer that I had been searching for. His webinar was dated December 15th last year. He mentioned that it was a few weeks earlier that the intervention occured. A few days ago, I had looked through some notes to see the progression of the energies. 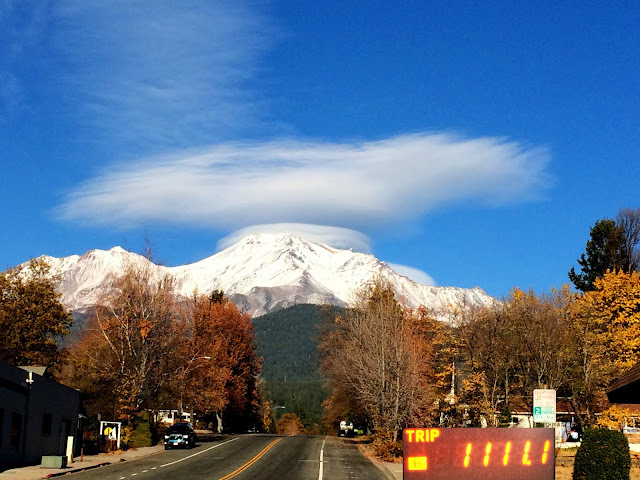 It was the last week in November, after the 11:11 portal and my trip to Shasta, that things shifted up to a whole other octave. Revelation, after revelation. I had even commented, “every day there's another revelation”. Where was it all coming from I wondered ? It was as if something had been ''switched on''. I felt as if I had been ''plugged in''. What's going on here ? THE FREQUENCY NET IS DOWN !!! And more revelations … I wonder, is this what all those cloudships were about, on the entire 2 hour ride to Shasta, during that same time period ? Was this the ''intervention'' ? Was the face on the mountain another sign ? And the one location that I posted about, where a ship had ''dived'' into a ravine, and I traced it to a volcanic plug ? I wondered, what were they doing deep inside the earth ? According to Alex's information, they are clearing out all the nasties below. This is historical news dear soul family. We are now able to tap into the wisdom OURSELVES. In the words of Kaypacha, we can ''become our own guru''. This is how we were designed, we weren't meant to rely on anything external to ourselves for our evolutionary wisdom. It's always been within, and now WE HAVE ACCESS. Alex's message is SELF-EMPOWERMENT. This is it. It is our time now. To cast off the old programming of reliance and dependence. Yes, the former Controllers must be scared, very very scared. An entire planet tapping in an waking up. Alex has another live webinar today, sure to be filled with enlightening and empowering information. Please share this link to help support this honorable man who has just confirmed for us our freedom and our self-empowerment. There is an important sequence in the cosmos which we can tap into to do our warrior work. Tomorrow marks the first day that there will be an occultation of the star Aldebaran by the Moon. How interesting that in this series there will be 13 of them this year. As I interpret this, the Lunar forces represent the feminine principles which are inherent in both men and women. Aldebaran is the star which has been associated with the Vril society and for those who have followed that thread, there are connections to the Nazis and other forces on this planet which are blocking our way home, using the suppression of the Divine Feminine as one of their magical tools. The number 13 is death and rebirth. It is also a number associated with the Goddess and the 13 moon calendar. We have the opportunity to work with the moon as she activates within us the ability to imprint the energies of the New Earth Timeline, as well as the Church of Love principles. Contact, communication and communion with exiled benevolent Space and Soul family is freely and widely available to all, as they choose. 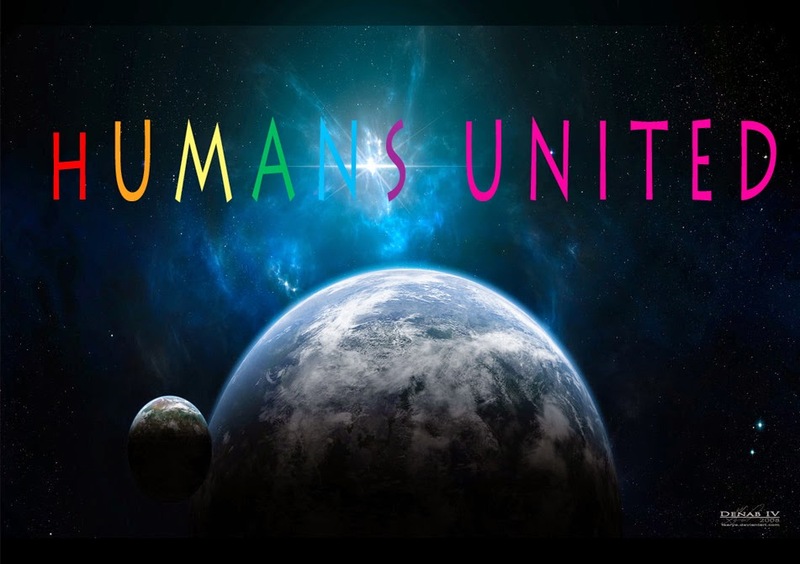 Harmony between all species is restored and respect and cooperation exists between all kingdoms and races: human, animal, plant and mineral as well as the Higher Angelic and Devic kingdoms. Divine Feminine and Sacred Masculine principles have been restored, united and harmonized in balance. It has no fabric, only understanding. It has no rivals, because it is non-competitive. It has no ambition, it seeks only to serve. It knows no boundaries for nationalisms are unloving. It is not of itself because it seeks to enrich all groups and religions. It acknowledges all great Teachers of all the ages who have shown the Truth of Love. Those who participate, practice the Truth of Love in all their beings. There is no walk of life or nationality that is a barrier. Those who are, know. It seeks not to teach but to be and, by being, enrich. It recognizes the whole planet as a Being of which we are a part. It recognizes that the time has come for the supreme transmutation, the ultimate alchemical act of conscious change of the ego into a voluntary return to the whole. It does not proclaim itself with a loud voice but in the subtle realms of loving. It salutes all those in the past who have blazed the path but have paid the price. It admits no hierarchy or structure, for no-one is greater than another. Its members shall know each other by their deeds and being and by their eyes and by no other outward sign save the fraternal embrace. Each one will dedicate their life to the silent loving of their neighbour and environment and the planet, while carrying out their task, however exalted or humble. It has no reward to offer either here or in the hereafter save that of the ineffable joy of being and loving. Each shall seek to advance the cause of understanding, doing good by stealth and teaching only by example. They shall heal their neighbour, their community and our Planet. They shall know no fear and feel no shame and their witness shall prevail over all odds. It has no secret, no arcanum, no initiation save that of true understanding of the power of Love and that, if we want it to be so, the world will change but only if we change ourselves first. ALL THOSE WHO BELONG, BELONG; THEY BELONG TO THE CHURCH OF LOVE. So tomorrow evening, January 19-20, if you feel called, please focus your intentions on this cosmic event, at 2:40UT/9:40 PM EST (on the 19th) for North America. Things have lined up in a synchronistic way for our January 17th Event, when we seed our intentions for the manifestation of the Church of Amor into a New Earth Timeline. Comet Catalina's is en route to it's destiny in the Universe and sets off the calendar year of 2016 in a manner which is of great impetus to our evolutionary path. It's current trajectory brings it in close proximity to the second star of the Big Dipper, Mizar. The Big Dipper has traditionally be regarded as the cosmic custodian to the 7 Rays of Divine Will. The star Mizar forms a binary pair with it's companion Alcor, and in esoteric lore, it is associated with the second ray qualities of unconditional Love and Wisdom, a potent amplification for our Church of Amor intentions. 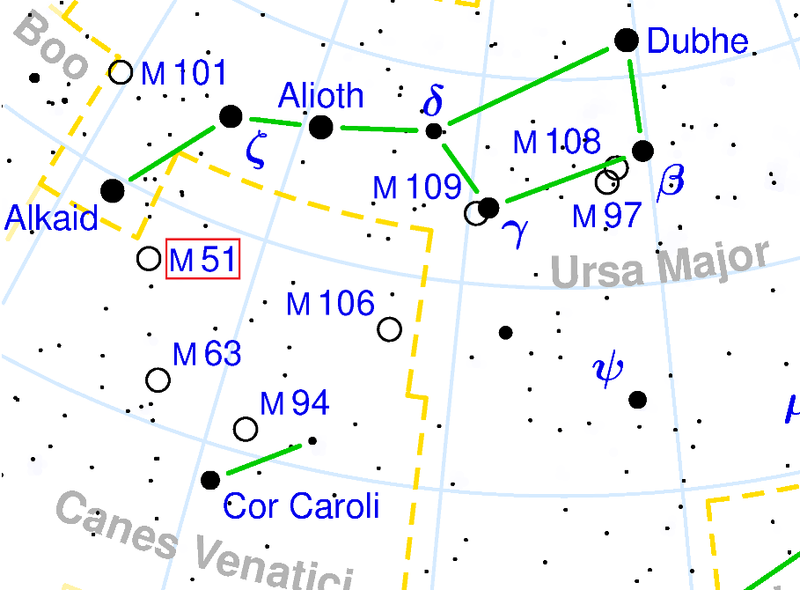 Catalina will also be touching upon another deep space luminary, passing between the Alcor/Mizar binary pair in the Big Dipper, and the galaxy M101 (the Pinwheel), about 2-3 degrees from each. Mizar is 30 in numerology and Alcor is 3 so together they create a vibration of 33 = christ consciousness. M101, the Pinwheel Galaxy, vibrates to 11/2 .. as a master number it transmits the energy of 11, illumination, and also is reminiscent of the 11:11 gateway, the unification, with 0 point at it's center. The Pinwheel Galaxy was discovered by Pierre Méchain on March 27, 1781. Coincidentally, March 27th is Easter Sunday this year, a foreshadowing of the energies of rebirth and resurrection. It's interesting to note, that there are 2 galaxies on either side of the tail of the Great Bear … the Pinwheel Galaxy (M101) and the Whirlpool Galaxy (M51). Each one of them, had a supernova explosion in the year 2011. Alkaid and Mizar begin the formation of the handle of the Big Dipper, and were both directly in the line of fire of these potent cosmic explosions,occuring within months of each other. We'll speak about the Pinwheel Galaxy Supernova first. Did he say Holy Grail ? The Pinwheel supernova phenomena has been active since 2011, when as recently as last year, on February 10, 2015, a luminous red nova was observed in the Pinwheel Galaxy by Dumitru Ciprian Vîntdevară from Planetarium and Astronomical Observatory of the Museum Vasile Parvan in Barlad, Romania. M51, the Whirlpool Galaxy has a close companion galaxy NGC 5195, and was the location of the first supernova, on June 1st 2011. This occured at the same time as a partial solar eclipse in Gemini, the Twins. Solar eclipses signify new beginnings, and this eclipse was also a part of a rare 3 part eclipse sequence. So as we read the tea leaves of the cosmos, we see the recurring theme of Love, Wisdom, Twins / Binary Stars / Companion galaxies, Illumination and Oneness, Resolution of Cosmic Mysteries / the Holy Grail and Resurrection. And so that is the foundation of our Event. 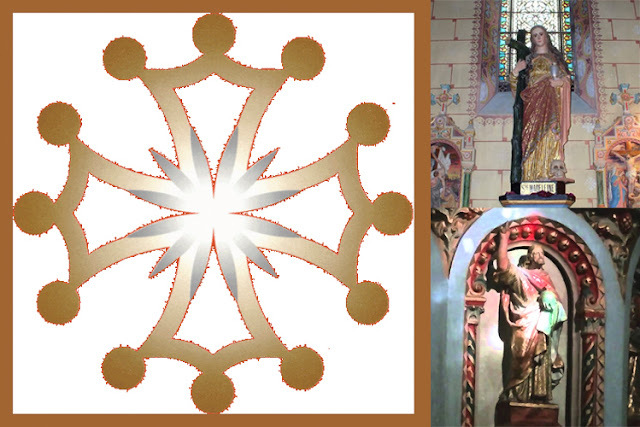 To add another layer: on January 17th of every year, there is a phenomena in the mysterious and legendary church dedicated to Mary Magdalene, Rennes-le-Chateau. It is called les Pommes Bleues or the Blue Apples. The Key of Life appears over the head of Jesus Christ and red and blue orbs … the color that Mary Magdalene is often pictured wearing, float around the statue. There is also excellent news about our New Earth timeline. According to Soluntra King, there will be a timeline merge *of 33 seconds * on January 17th as well. And so for our activities for the event on January 17th, we will be fully supported by the cosmos. At 12 noon CET, when the Blue Apple phenomena is occuring at Rennes le Chateau, we will link together and state our intentions to manifest the Church of Amor on earth. At 12:00 Noon CET, please connect with the church at Rennes le Chateau. Visualize the Blue Apples, with the Key Of Life above the Head of the Christed One, and proclaim with all your Heart . See all of the Earth, enveloped in the glow of the New Earth Church of Love. *You can use these intentions, and/or create your own unlimited visions. We will be beginning the new year of 2016 with a beautiful story which is being told in the skies this New Year.... a story of wonder and a story of completion involving the cosmic luminaries Sirius, the Comet Catalina and the star Arcturus. They are helping to awaken humanity and all those who respond to the Cathar prophecy of the 'Return of the Pure Ones' and the restitution of the Church of Love. They are calling out to the WayShowers. They are showing us the Way Home. With our Great Central Sun Sirius directly overhead at approximately midnight January 1, 2016, we have an immensity of Divine Light pouring down on us which with to work in calling forth our New Earth Timeline intentions. Through the wisdom teachings of Mary Magdalene and the Christed One, both of Sirian lineage, in 2016 we will walk upon the pathway of restoring our Divine blueprint, as it was created by Mother/Father God in the Pleroma, the gnostic term for the Galactic Core and the birthplace of the 12 stranded human genome, the Anthropos. Rudolph Steiner regarded comets as representatives of the Divine Feminine principle in the cosmos. The Divine Feminine, following the natural laws of the Universe, is now giving birth to the New Earth. She is represented by the Divine Mother, who was among others, the Virgin Mary in her Earthly incarnation. We are all her midwives, birthing the seed of Christ consciousness within ourselves so that it can be made manifest on Earth. In this way, completion of the Cathar's central creed, the Duality of Spirit and Matter is now being merged into unity, as we infuse Spirit into Matter on earth and build the Chrystalline grid. “Arcturus is known esoterically as the herder of the Divine Will emanating from the seven stars of the Big Dipper and acts as a bridge between these and Virgo the Virgin, nourisher of the Christ consciousness within the form. " Continuing onwards with the story of Cosmic Providence, after gathering the stellar energies of Arcturus, the next best view of Catalina on Earth will be January 17th, 2016, when it will be close to the star Mizar in the Big Dipper. The Seven Stars of the Big Dipper are the custodians of the Seven Rays of Divine Will. As the new calendar year of 2016 begins, we are being cosmically guided in a profound way, by Sirius, Comet Catalina, Arcturus and the Big Dipper to fulfill our Divine Purpose of creating Heaven on Earth at this profound moment in Time. And so we begin our activities, by first giving thanks and gratitude, to the Cosmic Forces and Beings, the Divine Shepherds, as they illuminate our way back home. If possible to do so at approximately midnight your local time, please spend a few moments to connect with our Group Light. Surround yourself with a forcefield of protection and begin the meditation. After completing the circumpolar meditation, and visualizing yourself connected within a rainbow bridge to the heart of Gaia, please invoke your chosen New Earth Timeline. If you feel guided, invoke the Presence of Mary Magdalene and the Christed One to act as guides, protectors and mentors on your journey. Visualize the Star of Sirius overhead in the night's sky, heralding a new year, a new frequency and a new reality. Send a beam of golden pink light from your heart to meet the Star. Follow this beam with your Light Body until you find yourself embraced by the nourishing glow of our Great Central Sun. 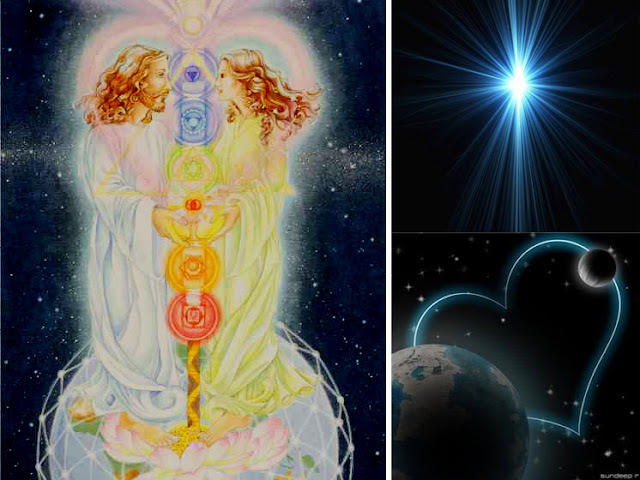 Feel this golden rose beam of light, connecting with the energies of the Christed Sirian Masters, who hold the template for our ascension and our Christ Consciousness. See them igniting a spark of brilliant light which transfers to your light body the perfect frequencies to activate your DNA strands to their full capacity. See this beam then, reaching your pineal gland, as it forms a golden violet triangle. Imagine a brilliant merkaba within this triangle, spinning in attunement with the flames of Divine Love, Power and Will. Acknowledge now, that your Chryst-alline Merkaba has now been activated and attuned with the 6th Dimensional Sirian Christed Masters. See yourself being at One with Mother/Father God and all of humanity. Thank them for the gift of your enlightenment, and travel in your Light Body on this golden pink frequency beam, back to Earth. Slowly return back into your physical body, and see yourself as a fully realized Christed Being.